(Cmd Z on a Mac). And if you think you’ll never want automatic link detection, you can disable it by opening the Preferences dialog from the Tools menu. 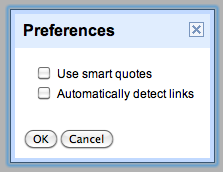 And for those who don’t like curly quotes (smart-quotes) you can now permanently disable them from the same preferences dialog. 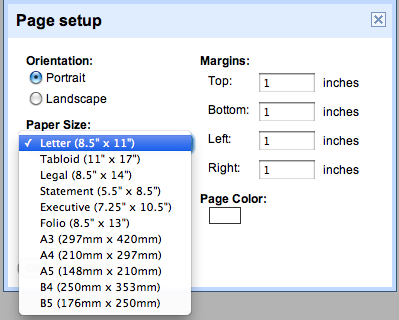 We’ve also added a few more page sizes for your documents. So if you’ve been craving an Executive sized page (7.25” x 10.5”), you’re in luck. You can find these page options by going File > Page Setup and choosing a size from there. Typing links just got a little faster in Google documents. Now when you type something that documents recognizes as a link, it will become a link automatically. Try typing “docs.google.com”, “www.google.com,” or an email address to try it out. If you don’t want your text to be a link, you can undo the auto-linking by pressing Ctrl Z (Cmd Z on a Mac). And if you think you’ll never want automatic link detection, you can disable it by opening the Preferences dialog from the Tools menu.